Digital Sports Journalism gives detailed guidance on a range of digital practices for producing content for smartphones and websites. 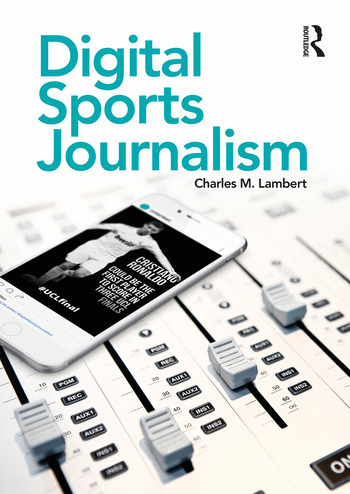 Each chapter discusses a skill that has become essential for sports journalists today, with student-friendly features throughout to support learning. These include case studies, examples of sports journalism from leading global publications, as well as top tips and practical exercises. The book also presents interviews with leading sport and club journalists with wide-ranging experience at the BBC, Copa90, Wimbledon Tennis, the Guardian and BT Sport, who discuss working with new technologies to cover sports stories and events. The job of a sports journalist has altered dramatically over the first two decades of the 21st century, with scope to write content across a new variety of digital platforms and mediums. Digital Sports Journalism will help students of journalism and professionals unlock the potential of these new media technologies. Introduction, Digital content: first principles Chapter 1: Digital storytelling Chapter 2: Getting set up Chapter 3: Social media Match day: reporting a sporting event Chapter 4: Live blogging Chapter 5: Match reporting New Techniques Chapter 6: Attracting an audience Chapter 7: Video-making Chapter 8: Sports jounralism and data One-club journalism Chapter 9: The club journalist Chapter 10: The fan journalist Major Projects: Longer pieces of sports journalism Chapter 11: Podcasts Chapter 12: Longform journalism, Glossary. Charles M. Lambert spent two decades as a television journalist, covering news and sport for the BBC and ITV. He has run the sports journalism degree courses at the University of East London and the University for the Creative Arts, UK, where he’s now in charge of the journalism and media cluster.